One day, when I was around fourteen, my dad was invited to a black-tie fund-raising dinner. And so he broke out the tuxedo my mom had found for him at the Salvation Army and clipped on his bow tie, and took the Metro-North into Manhattan. He returned bearing gifts: the favor bag included a cookbook of light French cuisine and a gadget that was the most wonderful thing we had ever seen. It was a wine stopper. Two, actually, identical to each other. Its bottom section was conical, covered in rubber, and its top was a large metal heart. It was indisputably ugly, we all agreed—but how ingenious! My mom was delighted. “If we have leftover wine,” she explained, “we won’t need to jam the cork into the bottle, or use tinfoil.” (Screw-tops were still a novelty in the midnineties.) What a marvel of thrift and engineering! For the next few years, we used the wine stoppers all the time, and not just on the occasional bottle of pinot grigio: they worked to stop bottles of vinegar whose caps had gone missing, or that cooking sherry whose cork had fallen into the bottle or—well, I guess that’s it. But we never saw either stopper without marveling at our good fortune. And they had been free! After I graduated college and moved into an apartment with a roommate, my mother offered me one of the wine stoppers. “I won’t,” I said fervently. And I didn’t. I took the stopper and honored that promise for more than ten years. Wherever I moved, the heart-shaped stopper went with me. On any given day, there was a quarter-bottle of vinegary, cheap wine sitting in my fridge door, the heart sticking up jauntily. As long as the stopper was in it, I considered it good. Now, I wasn’t completely blinded by love: the truth is, the stopper was inconvenient. The heart (which stood a good two inches) made the bottle too tall to fit in the door easily. Usually I had to prop it on its side against a jar of mustard or something, which meant things frequently tumbled out of the refrigerator when I opened it. Occasionally the bottle itself would fall out and spill the sour wine on the floor (which was always a secret relief). If you attempted to lay the bottle on its side on a lower shelf, the heart invariably slipped out and drenched the contents of the crisper. I won’t lie to you: roommates and boyfriends didn’t love it. It was even suggested that I get rid of it. I couldn’t help but notice that people other than me avoided using my stopper, even reverting to the foil dark ages. It’s true, over the years, the heart had begun to rust. But it remained one of the finest items I owned, its pedigree impeccable. 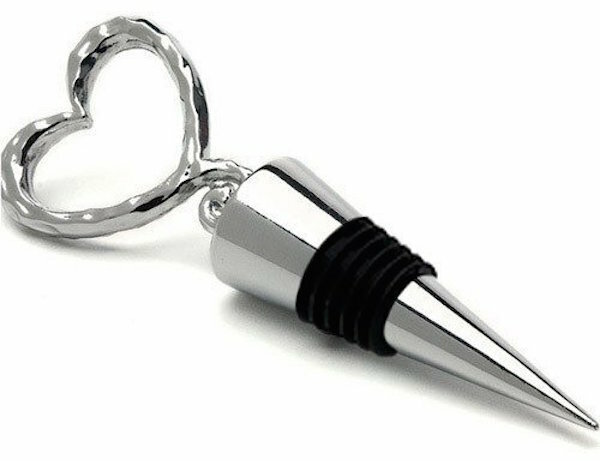 And then, a few months ago, a wine bottle took a spill and the heart fell off the stopper. I felt a real panic, the kind normally reserved for those moments when you are two minutes into “Nothing Compares 2 U” at karaoke and realize there are, like, four minutes left, and you’ve made a horrible mistake. I tried to Krazy Glue it. I tried to attach it with a rubber band. I tried to use the stopper without the heart, but it was impossible to get any purchase and remove it from the bottle. In the end, it had to go into the trash along with the remains of some cheap pinot a friend had brought to a party. I told myself it was sort of like a pharaoh going to the next life with provisions, and kept the heart as a souvenir, in the part of my kitchen drawer reserved for useless miscellany and soy-sauce packets. I felt the lack. I didn’t even want to buy wine anymore, because it was an exercise in wretched excess. With the wine stopper, I had felt like a millionaire. No more. I was in the supermarket over the weekend, looking at the collection of gadgets and tools—bamboo skewers, corncob holders, cheap metal can openers—when I saw it: a packet of three rubber wine stoppers. It was $3.99. Because they were not decorated with large metal hearts, they would allow a bottle to sit comfortably on a fridge shelf.